Test ,test,test,well my sons test is on and I’m super duper busy teaching myself,him. I have started digging my old foody albums which I have a lot of collection though not fantastic shots.My day is incomplete without posting in my blog, atleast alternate day I have to post.So today I’m sharing with you’ll a super fantastic and a quick dosa recipe of Instant uttappam,and the recipe was shared by my good friend Suphala shenoy. 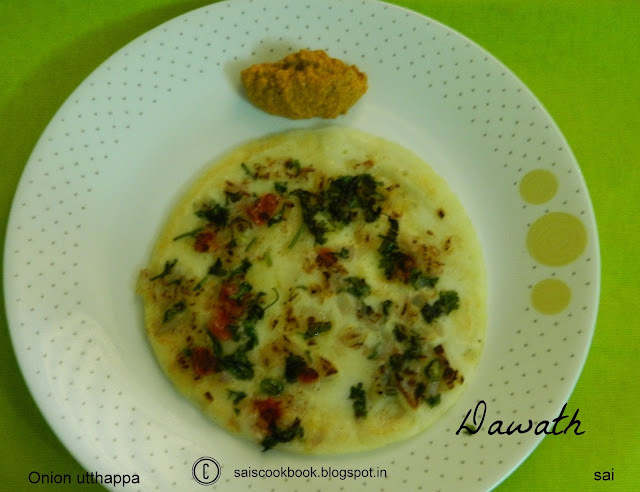 Suphala has a collection of fantastic veggie delicacies in her kitty.I have always admired the way she presented her dishes in the food groups…So I present before you ll an easy peasy recipe of the uttappam. Mix together curds,water,rawa,salt,baking soda and keep it aside for 15 minutes. Mix together capsicum and onion,chilly powder and cumin seeds in a bowl. Heat a tawa and add a laddle of batter on it. Do not spread the batter,sprinkle veggies on top of it,cover with a lid and cook for a minute. Open the lid ,smear it with oil and flip the uttappa to the opposite side and roast until the onion turns brown. Serve it hot with chutney and a cuppa coffee. You may also add other veggies of your choice like tomato.